Measure ingredients and add to a blender. Blend well until smooth. Enjoy for breakfast, lunch, snack, dessert, or anytime. As I’ve mentioned in previous posts, in the past I’ve deviated from a vegan diet due to cravings for animal protein. The more I learn about nutrition, the more apparent it’s become to me that we are all unique and the most important thing is to listen to your own body while being mindful of nutrition. It’s also important to not judge yourself when it comes to what you eat and instead be an observer of how your food makes you feel! Maybe you’re a vegan for ethical purposes but find yourself having an occasional craving for animal products. Take a look at your diet and see if you’re missing out on an important nutrient, like iron, protein, calcium or omega 3’s and then see if eating more plant sources of those nutrients alleviates some of your cravings (in my experience, that piece of advice really helped!). Above all, always try your best, but know that “diet perfection” doesn’t exist. One thing that I’ve also realized is that sometimes eating the same things can get really repetitive and can also lead to cravings for things that you wouldn’t normally eat. With this in mind, I decided to try my hand at making vegan macaroni and cheese because who doesn’t love a serving of comfort food every now and then? This recipe is actually a combination of a few recipes gathered from Daiya brand’s website and from a dish that my favorite health food store makes as one of their “hot lunch specials”. I put my own spin on it by adding some vegan mock-meat sausage for added protein and a spicy taste, but feel free to omit that component if you’re looking for a more classic mac and cheese taste. Remove the pot from the stove and drain the macaroni, set aside. In a medium saucepan, melt the vegan buttery spread on low heat. While the buttery spread melts, cut up the Field Roast vegan sausage into small pieces and cook in a separate saucepan on low heat until brown (about 5 minutes). Remove from heat and set aside. Add the nutritional yeast and pepper to the vegan buttery spread saucepan. Add the almond milk to the above saucepan. Add the Daiya cheddar shreds to the above saucepan. Use a spoon to mix on low-medium heat. Once the Daiya cheddar shreds have melted, turn off the heat. 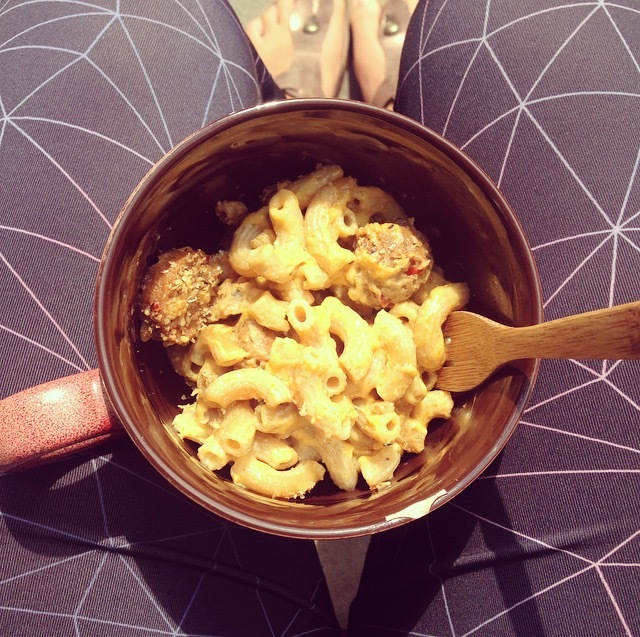 In a large oven-safe casserole dish, mix the drained macaroni and Field Roast vegan sausage. 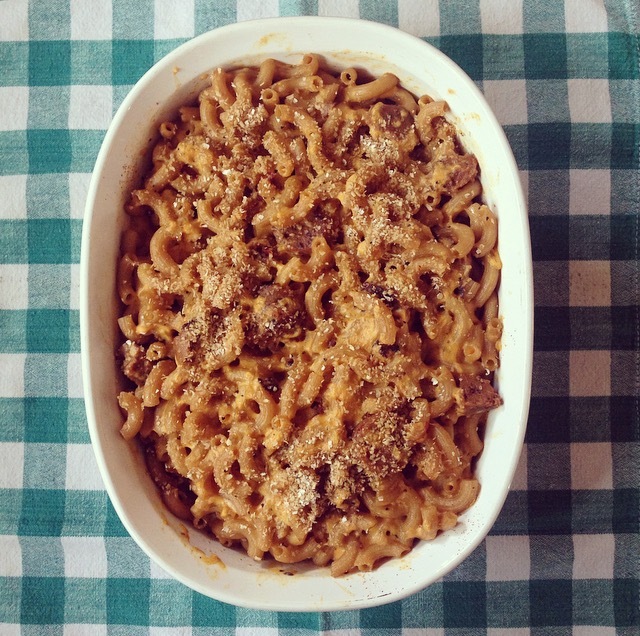 Add the vegan cheese mixture and use a spoon to make sure that the macaroni is evenly topped with vegan cheese. Top the mixture with breadcrumbs or oat bran. Bake for 15-20 minutes or until the top is golden. The most beautiful melty, “cheesy”, non-dairy meal I’ve ever had! One of the best things about summer is that it’s a great time to use ingredients that are grown locally. Shopping at farmers markets and stores that support community agriculture is one way to live healthier for yourself and for the planet. The following recipe was inspired by local tomatoes, corn, and beets. This recipe is vegan, gluten free, and makes a great main course, side dish, and can also be used as a dip or cracker topping. Whichever way you eat it, enjoy it! 1 ear of corn, cut off the cob (note: I didn’t cook the corn I used, but if you want, you can also boil it along with the beets). Boil water in a pot, and while you’re waiting, peel the beets and cut the other ingredients. The avocado and tomato can be diced or cubed. Remove the corn from the cob and set aside ingredients. Place the beets in the boiling water and allow to cook for 15-20 minutes or until soft. Remove the beets from the boiling water and allow to cool. Then, cube the beets using a knife. 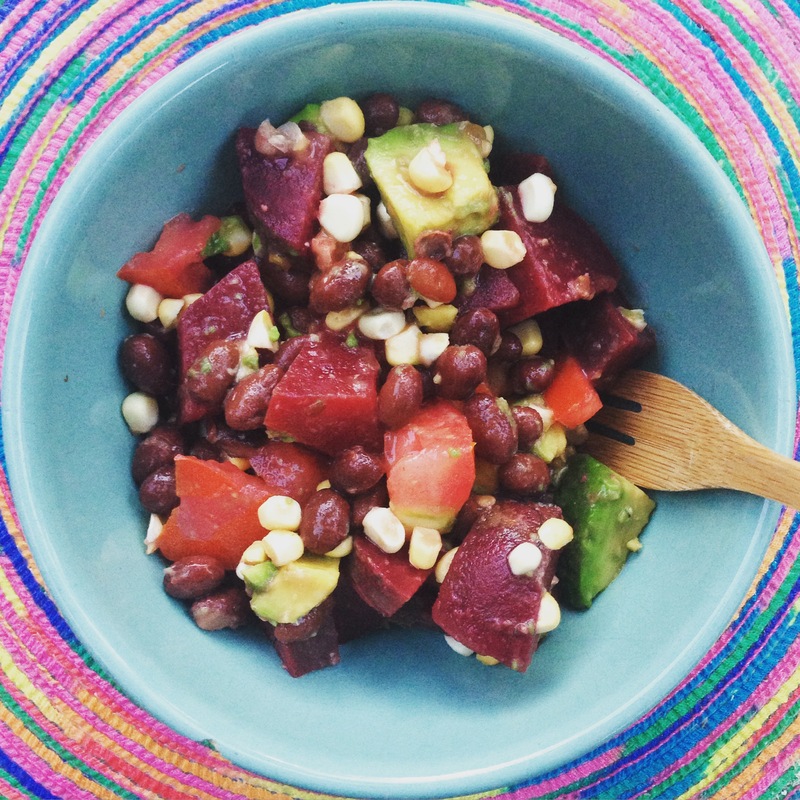 Drain the black beans, and mix the corn, beets, tomato, and avocado together. Enjoy as a main course by adding this to taco shells, or enjoy as a side dish. The spring semester has come to a close! (yay). I’ve completed another year as a nutrition student, and now I have just another year until I’m done with my master’s. One thing that got me through finals was having quick meals packed with nutrition. 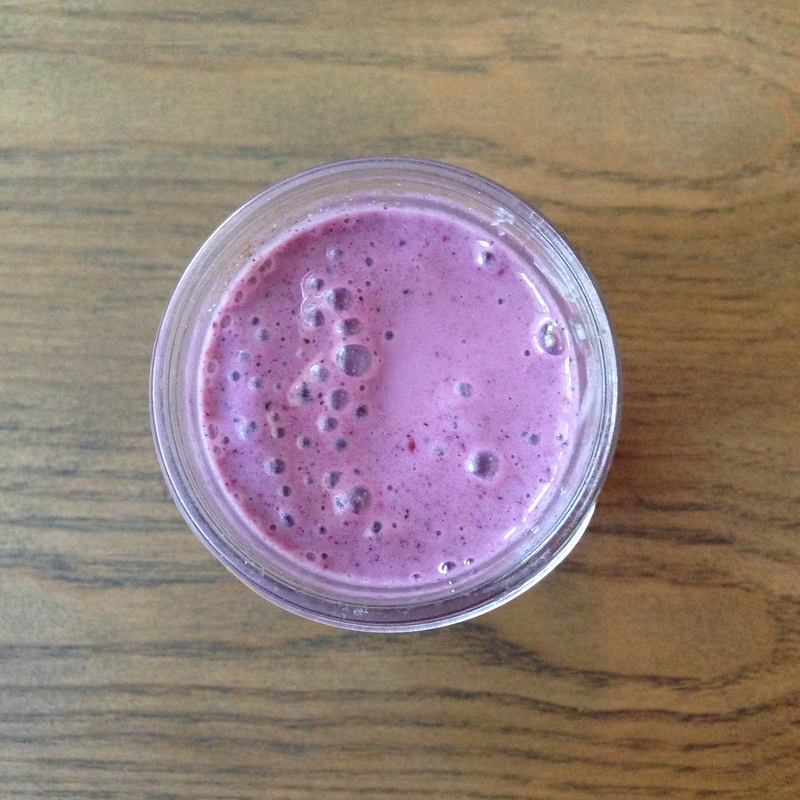 A favorite meal during finals (and whenever, really) is the following smoothie recipe. It’s packed with protein, fiber, antioxidants, vitamins, minerals, and it’s delicious! Combine all ingredients in a blender, and blend on high until uniform in texture and appearance. Pour into a large cup and enjoy! This makes a large portion, so feel free to share with a friend or divide into two and enjoy half of it for a snack later. Hello readers! It’s been almost a month since I last posted. As you can tell, I’ve been pretty busy! I started the spring semester in late january and my yoga teacher training is almost done (although, I still have a lot of work to do, including a yoga practical and teaching a class on my own!). This semester is jam-packed for me because I decided to double-up on credits, so I’m actually taking double the amount of graduate courses I’m expected to…whoops! Since this blog isn’t about my academic career, I’ll switch gears now and talk about the delicious recipes I’ve been cooking up. Having limited time has actually made me become a little more creative when it comes to cooking, which is good, because as any busy vegan can tell you, microwaved veggie burgers can get awfully boring after a while. Falafel has been a favorite food of mine, and it’s my go-to order at any middle-eastern restaurant. 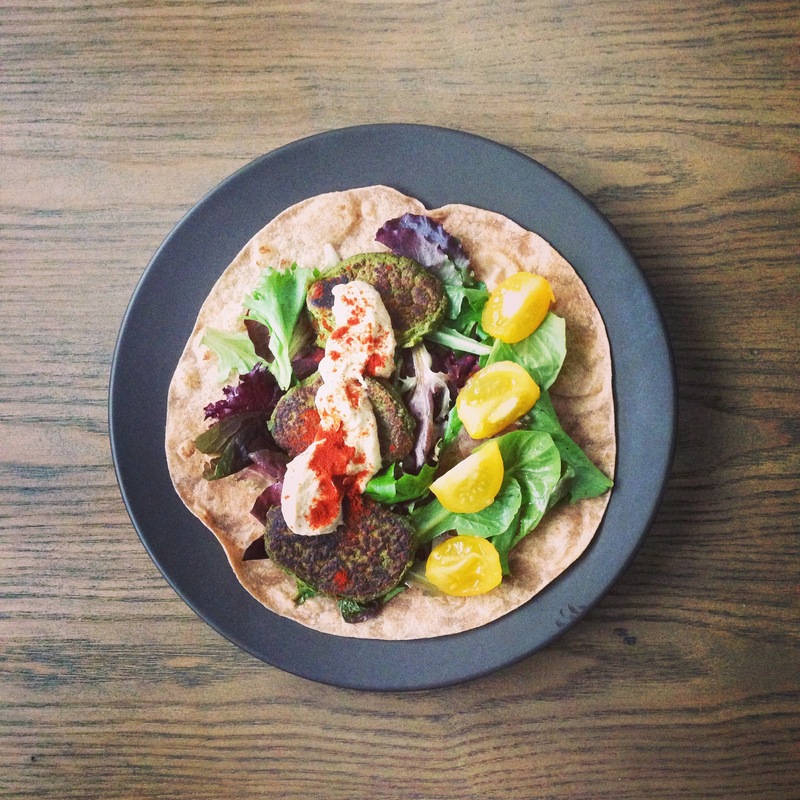 I decided to create my own healthier version of falafel, with added collard greens into the mixture. This recipe is tasty, easy, and not too labor intensive, so have fun and enjoy! Combine chickpeas, collard greens, spices, and flour in a food processor and process until you have a uniform mixture (about a minute or two of total food processing time). If you don’t have a food processor, you can try using a blender but the food processor is your best bet for this recipe. If you find that the chickpea balls aren’t cooking all the way through, feel free to flatten them a bit to create more of a “patty” than a ball. Don’t worry, it will still taste just as good!